Jesus left Genenesaret and withdrew to the region of Tyre and Sidon. Then out came a Canaanite woman from that district and started shouting, ‘Sir, Son of David, take pity on me. My daughter is tormented by a devil.’ But he answered her not a word. And his disciples went and pleaded with him. ‘Give her what she wants,’ they said ‘because she is shouting after us.’ He said in reply, ‘I was sent only to the lost sheep of the House of Israel’. 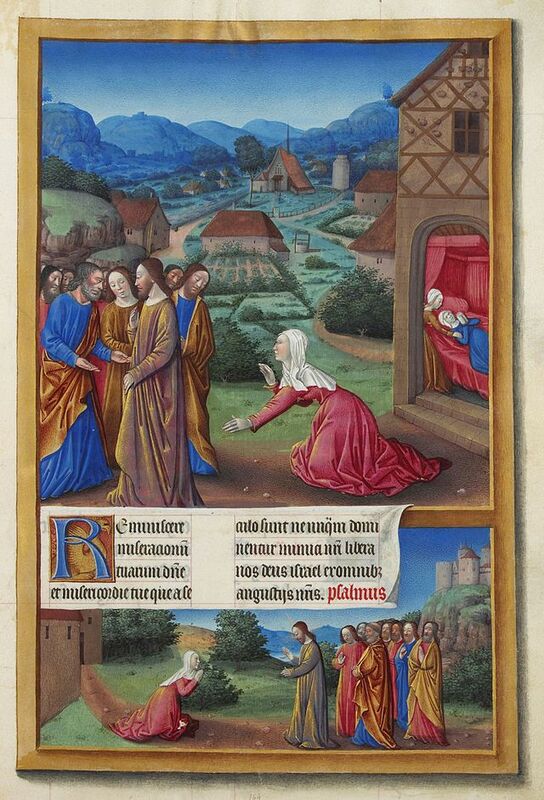 But the woman had come up and was kneeling at his feet. ‘Lord,’ she said ‘help me.’ He replied, ‘It is not fair to take the children’s food and throw it to the house-dogs’. She retorted, ‘Ah yes, sir; but even house-dogs can eat the scraps that fall from their master’s table’. Then Jesus answered her, ‘Woman, you have great faith. Let your wish be granted.’ And from that moment her daughter was well again. Jesus was testing her. He saw faith, but he wanted everyone else to see it. So he told her she didn’t fit into the local religious sphere because she was foreigner, an asylum seeker or a refugee. Or a lone mother who had a bad name. She knew she fitted into the heart of Jesus simply because she was the mother of a sick child. Even if he would cure everyone, maybe he would come back to her at the end. Even a discretionary cure, like a medical card! Jesus went further – he cured her child and praised her faith. Faith in a surprising God who in Jesus his Son, never says no to goodness. Faith that keeps us energetic and alive, not tired, in soul as well as body. This entry was posted in Gospel of Matthew, Gospel Reflection, Liturgy Resources, Prayer Resources, Scripture and tagged Donal Neary SJ, Faith, Faith of a Mother, Gospel Reflection, Healing, Justice, Matthew 15:21-28, Miracle, Pope Francis, Sunday Gospel Reading and Reflection for 10th August 2014, Sunday Gospel Reading and Reflection for 17th August 2014, Sunday Scripture and Reflection for 20th Sunday Ordinary Time Year A.